Michael Brune, executive director of the Sierra Club, holds degrees in Economics and Finance from West Chester University in Pennsylvania and comes to the Sierra Club from the Rainforest Action Network. Did you make it through Donald Trump's State of the Union address? If you did, congratulations on your endurance. Not everyone can handle sitting through more than an hour of lies, deceit and distortions. Then again, we've all been surviving and fighting through the past 12 months of this administration. Resistance takes stamina, and it's clear that it's made us stronger. This Sunday marks the first anniversary of the Women's March that happened on the day after Donald Trump's inauguration—the largest protest march in our nation's history. The Sierra Club was there that day, and we'll be there this year, too—at a significant moment for women's rights and justice. For Donald Trump, people seem to belong in one of four categories: family, assets, enemies or irrelevant. Most of the American public has been consigned to the last category. That's why you'll never catch this president rhapsodizing about the honor of public service. The sole basis, apparently, for any decision Donald Trump makes is whether he believes it will help Donald Trump. The concept of public welfare—including whether people live or die—simply isn't part of his calculus. That was reinforced Wednesday as Trump announced that his asset at the U.S. Environmental Protection Agency (EPA), Scott Pruitt, will replace the Clean Power Plan. Carefully developed during the Obama administration as a way to limit carbon pollution from power plants, the Clean Power Plan is a centerpiece of our nation's climate policy. Pruitt, though, claims that because the plan demands clean air, it is effectively picking winners and losers in the energy market. After all, if the goal is clean air, then dirty fuels can't compete because they're, well, dirty. Tuesday in the midst of a national emergency along the Gulf Coast, Donald Trump's attorney general, Jefferson Beauregard Sessions, is set to announce the termination of the Deferred Action for Childhood Arrivals (DACA) program, leaving it up to congress to protect the more than 800,000 young undocumented immigrants in the program. DACA, put in place by the Obama administration, provided protections from deportations and the ability to work and attend school for young undocumented immigrants or Dreamers, brought to the U.S. as children. Houston is home to 56,800 dreamers. At the conclusion of this year's contentious G-20 summit, the countries released a communique on climate that placed Donald Trump starkly at odds with every other nation present. The communique noted that every country aside from the U.S. recognizes that the Paris agreement is "irreversible," reaffirmed their "strong commitment" and will move "swiftly towards its full implementation in accordance with the principle of common but differentiated responsibilities and respective capabilities." The U.S. Fish and Wildlife Service removed grizzly bears in the Greater Yellowstone region on Thursday from the Endangered Species List. The decision comes despite serious concerns in the scientific community about a declining, isolated population with diminishing food resources and record-high mortalities, as well as strong opposition from an unprecedented number of Tribal Nations. Scott Pruitt took to the Sunday shows today in a troubled attempt to spin the Trump administration's decision to pull out of the Paris climate agreement, amid a firestorm of international and domestic criticism. Donald Trump announced today that he intends to withdraw the U.S. from the Paris climate agreement. According to the terms of the agreement, no country can begin the withdrawal process until three years after the agreement enters into force and the withdrawal would not take effect for one year after that date. It was widely reported this morning that Donald Trump intends to withdraw the U.S. from the Paris climate agreement. According to the terms of the agreement, no country can begin the withdrawal process until three years after the agreement enters into force. 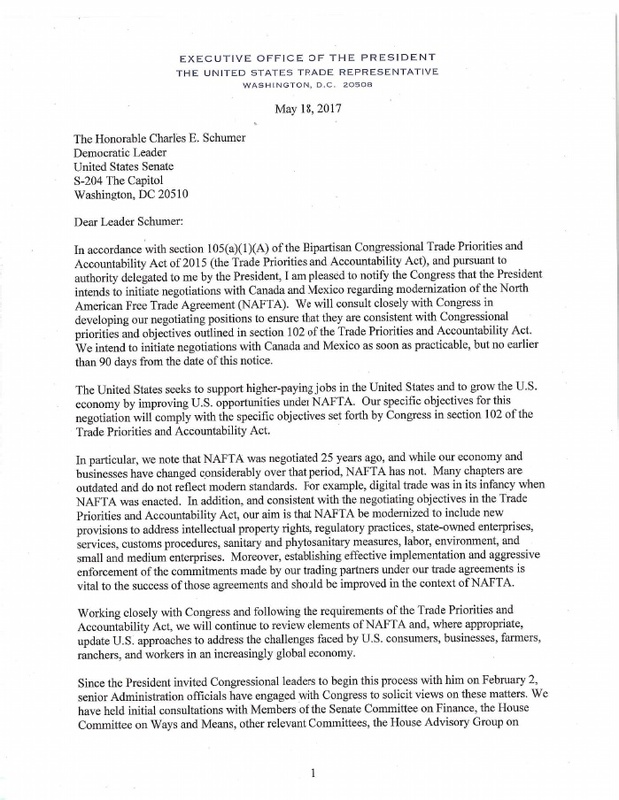 The Trump administration notified Congress Thursday of its intent to renegotiate the North American Free Trade Agreement (NAFTA) with Canada and Mexico. Throughout his candidacy, Trump proclaimed he would "announce" plans to "totally renegotiate" NAFTA on "day one" of his presidency. Today is the 119th day of his presidency.